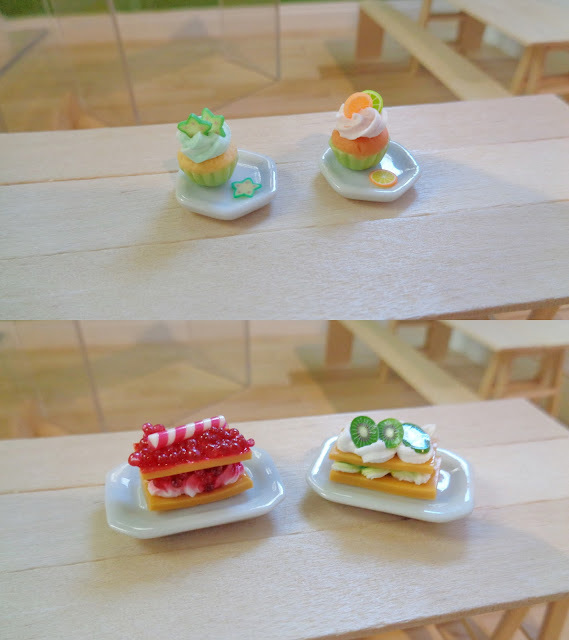 Welcome to the new and improved figure café. Now why another re-do of the café you may ask, well originally when I set out to build a permanent café I had something in mind but for whatever reason decided to play it safe to begin with and so for many months I've wanted to embark on a renovation to bring my first vision to light. The first major thing was that I always wanted the bricks to be painted white as I love white painted bricks thus the outside of the café got a spruce up and the door and its handle was changed too to fit into the new interior colour scheme. I also found some awesome chalkboard stickers and I used one as the sign for outside. Now lets to inside and check out the new Café Fruits. First thing you will notice is the vibrant yellow paint on two of the walls, isn't it a gorgeous shade. I also added wood panelling to the bay window because it looked cool and it matches the floor boards. 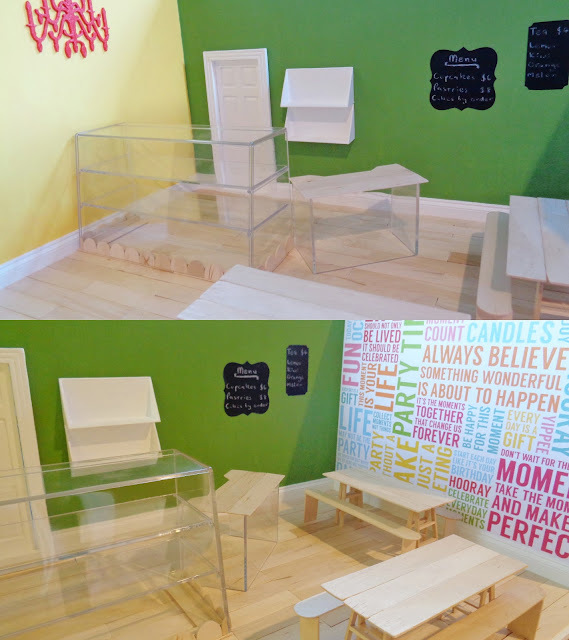 The flooring was inspired by another crafter, popsicle sticks cut into floor boards and glued down. I also incorporated something I had first envisioned on the inside, a feature wall of printed card giving the appearance of wallpaper. As you can see from above there is now a definite décor and colour scheme making it feel more realistic and trendy, which is what I always wanted. Although I have gotten rid of most of the mismatching items from the original café I have kept some things, the chandelier I repainted to match the exterior of the front door and the café display pieces I have attached to the wall as shelves. The new pieces include more of the chalkboard stickers which act as menu's and a number of furnishings which I will go into more detail below. First there is the café display case, I recently bought the Re-ment Petite Sample Series Showcase which I then altered to my own purposes. As you can see I removed the base in order to make it a figma friendly height. I then used some of my popsicle sticks to make a base and also a pretty boarder along the bottom. Now one thing quickly became apparent, I would no longer be able to use the box shaped display and so I have repurposed that into a counter. Once again using popsicle sticks. I also bought several miniatures from ebay and etsy, there reviews you can see here. The ladders I ordered I used to make trestle style tables with popsicle sticks forming the table top. Continuing the popsicle stick theme I made benches to go on either side of the tables. 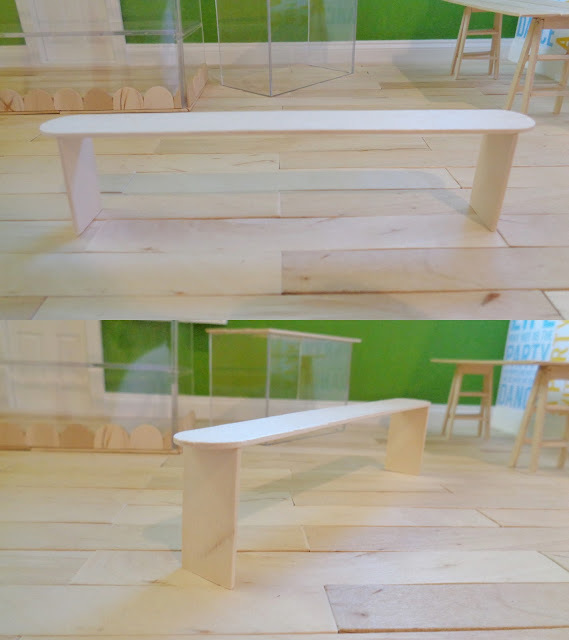 Making my own benches was really the only option in order to get the height right for the tables and for the figmas. It is rather difficult trying to find chairs which they can sit on properly. I then made further alterations to some of the items I purchased. 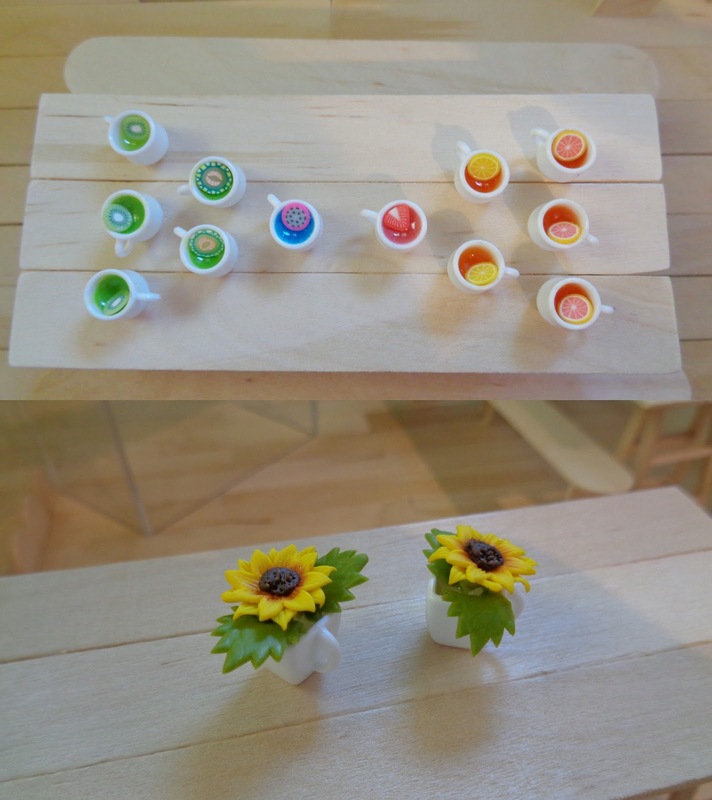 The cups I customised by adding fruit slices and the sunflowers I cut up and using my free gift I made little table displays. I also got plates to fit my cakes and don't they look absolutely scrumptious. My fruit slices also look great in the jars and I can fit a selection of treats in my two white trays. Then to finish it all off are the jugs for holding the cutlery. 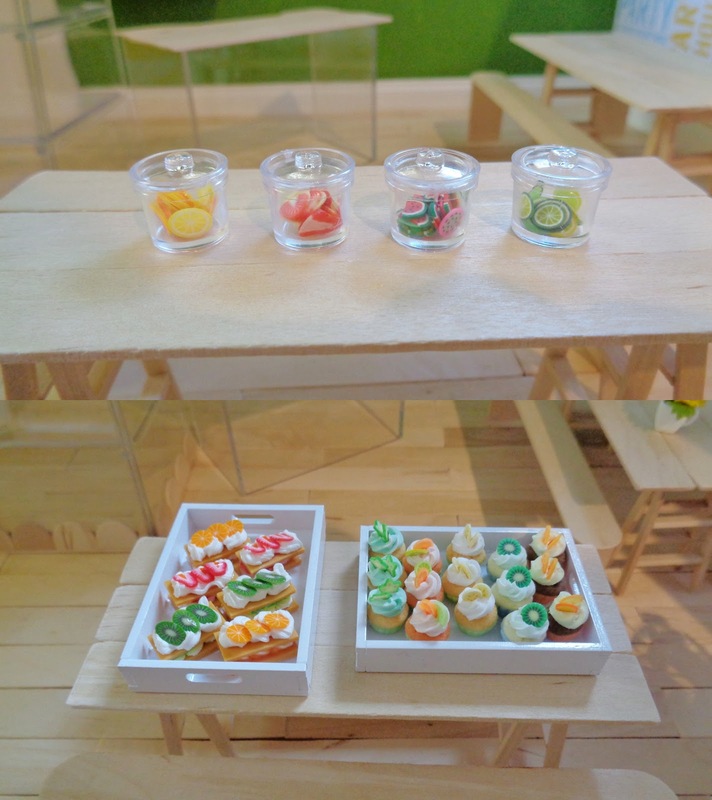 With all the elements combined the new and improved Fruits Café is ready to open for business.